On Friday 8 February DSW visited St James to educate the children on the importance of Wetlands in South Africa as well as world wide. 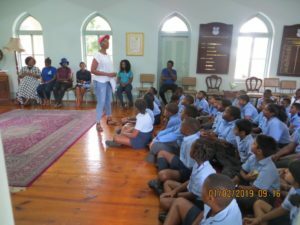 St James aims at educating their children about the importance of conserving our environment and how each and every person, no matter their age, can make an impact. Together with talks like this to educate the children, St James has it’s own recycling programme, eco-monitors who make sure that each and every child is playing their part, they take part in beach clean-ups on a regular basis and are a bronze member of ECO SCHOOLS. St James will be holding an Eco Week between 11 and 15 March, watch this space for more details and pictures of our Eco Warriors!